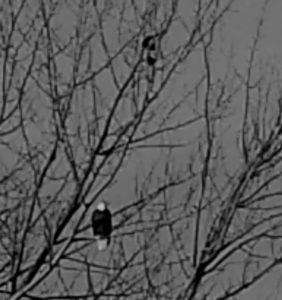 An eagle came to perch on the upper branches of the cottonwood tree on the farm that would soon no longer be our home. It was a magnificent bird, mature, head strong and white as white. It was watching, head turned towards the house as we sat in our bare dining room on the only chairs left in the house, looking out on our penultimate evening to the barn where the setting sun had once again turned the fir planks a soft lavender. Our purple barn. As I went out across the yard to get one of the last boxes from the barn’s huge dim interior, the huge eagle, still in the cottonwood, called its screeching call, piercing notes echoing slightly in the cooling air. We worked steadily from early the next morning till late that next night, emptying the last things from the house, and then the last things after that, hauling them to the small storage space or the dump. Then cleaning the house. The weeds in the garden wanted to be pulled, but I passed them by as I walked to the mailbox, ignoring their cries. The rose bushes wanted to be pruned of their winter damage and those that climbed, tied again against their supports, but I told them they would have to wait for someone else to guide them. In our bed in the little trailer after an exhausted short sleep, I awoke to swirling fears, a seemingly endless expanse of dark possibilities, ruin, homelessness. I pulled the thoughts in. I made them hush themselves in the darkness and I went deeply into my heart and the heart of that huge expanse. I went deeper and deeper, wider and wider into the silence. By the time the first birds began to chirp, the ones that see the light with some inner eye before the sun’s rays begin to penetrate, I was ready to fall into sleep. “You’ve done the work. Now rest.” I slept and dreamed and woke up to the soft sounds of cows munching grass and geese calling as they flew towards the fields beyond, I calmly joyous, ready to laugh. And here we are on a plane flying over Manitoba, lakes and square fields patterned on a tapestry rug below. I’m thinking how I woke this morning for the second time, after getting up in the night to attend to all the last minute things I hadn’t been able to do, to the chattering cries of another eagle, unseen, somewhere to the morning side of the little trailer. A joyous rousing. A call to come and take part in this marvellous moment. So I did. And made coffee. And smiled at Walter who was turning over to sleep just a little while longer. Are the new farm owners letting you keep a small storage on the property? No. We’ve rented a small space that we’ll return to in 5 mos. We’ll see what to do with it then. Otherwise, it’s a small suitcase and a backpack–a kind of freedom!